The cornea is the clear front window of the eye. It covers the iris (colored portion of the eye) and the round pupil, much like a watch crystal covers the face of a watch. 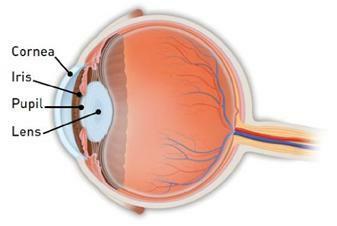 The cornea is composed of five layers. The outermost layer is called the epithelium. A corneal abrasion is an injury (a scratch, scrape or cut) to the epithelium. Abrasions are commonly caused by fingernail scratches, paper cuts, makeup brushes, scrapes from tree or bush limbs and rubbing the eye. Some eye conditions, such as dry eye, increase the chance of an abrasion. WHAT ARE THE SYMPTOMS OF A CORNEAL ABRASION? · Wearing a special contact lens to help healing. Minor abrasions usually heal within a day or two; larger abrasions usually take about a week. It is important not to rub the eye while it is healing. Do not wear your usual contact lenses while the eye is healing. Ask Dr. Landa when you may start wearing your lenses again.